Sunny California is leading the way to tap solar energy. Can sunny Pakistan follow to deal with its crippling energy crisis? California based BrightSource Energy, which already has a deal to build a series of huge solar power plants in the Mojave Desert for Pacific Gas & Electric (PG&E), announced an even larger project recently with Southern California Edison. Brightsource, with its roots in Israel, launched its first big solar project last year in the Negev desert. The World Economic Forum voted BrightSource as a 2009 Technology Pioneer. It was the only solar company to win this year's award, and is recognized for helping industrial customers reduce their dependence on fossil fuels. By 2016, the two companies said, BrightSource will build a series of solar-thermal power plants that will generate 1.3 gigawatts of electricity for Southern California Edison's customers. That's enough power for 845,000 homes, said Stuart Hemphill, the utility's vice president of renewable and alternative power. Talking with SiliconValley.com, he characterized the deal as "the largest set of solar agreements ever signed." Photo-voltaic solar power panels are often used for local and distributed power generation capability, such as on rooftops of homes and buildings. It is generally on-grid but it can be off-grid for remote places. Unlike the solar panel's relying on photo-voltaic cells, solar thermal power is centrally generated from thousands of curved mirrors in the desert focusing sun's light on to water pipes to generate superheated steam which is then used to generate electricity. It is then connected to the grid and transmitted to major population centers. The first such experimental power plant was set up in California's Mojave desert in the 1980s and many of its pioneers are now helping Brightsource to go big with solar thermal. The deal is another step toward meeting California mandates for renewable-energy generation. Investor-owned utilities such as PG&E are required to get 20 percent of their power from renewable sources by the end of 2010, and 33 percent by 2020. Even before this latest development, the state's Energy Commission was reviewing seven solar-thermal projects that could generate nearly 2.6 gigawatts worth of electricity. California is very sunny, but so are other places such as Pakistan. In fact, Pakistan is an exceptionally sunny country. If 0.25% of Balochistan was covered with solar panels with an efficiency of 20%, enough electricity would be generated to cover all of Pakistani demand. Solar energy makes much sense for Pakistan for several reasons: firstly, 70% of the population lives in 50,000 villages that are very far away from the national grid, according to a report by the Solar Energy Research Center (SERC). Besides, the country's creaky and outdated electricity infrastructure loses over 30 percent of generated power in transit, more than seven times the losses of a well-run system, according to the Asian Development Bank and the World Bank; and a lack of spare high-voltage grid capacity limits the transmission of power from hydroelectric plants in the north to make up for shortfalls in the south.Connecting these villages to the national grid would be very costly, thus giving each house a solar panel would be cost efficient and would empower people both economically and socially. Pakistani blog Pakistaniat has reported practical examples of the use of solar energy as seen in some villages of Pakistan where each house has been provided with a solar panel that’s sufficient to run an electric fan and two energy saving bulbs. Prior to this arrangement, the whole village used to be plunged in darkness at night. In Narian Khorian, a village about 50 kilometers from Islamabad, 100 solar panels have been installed by a local firm, free of cost, to promote the use of solar energy. With these panels, the residents of 100 households are enjoying light and fan facilities. This would not have happened for decades as the supply of electricity from the national grid would be difficult and costly due to the mountainous terrain. In addition to renewable energy from the sun, Pakistan is also fortunate to have something many other countries do not, which are high wind speeds near major centers. Near Islamabad, the wind speed is anywhere from 6.2 to 7.4 meters per second (between 13.8 and 16.5 miles per hour). Near Karachi, the range is between 6.2 and 6.9 (between 13.8 and 15.4 miles per hour). Pakistan is also fortunate that in neighboring India, the company Suzlon manufactures wind turbines, thus decreasing transportation costs. Working with Suzlon, Pakistan can begin to build its own wind-turbine industry and create thousands of new jobs while solving its energy problems. Suzlon turbines start to turn at a speed of 3 meters per second. Vestas, which is one of the world's largest wind turbine manufacturers, has wind turbines that start turning at a speed of 4 meters per second. 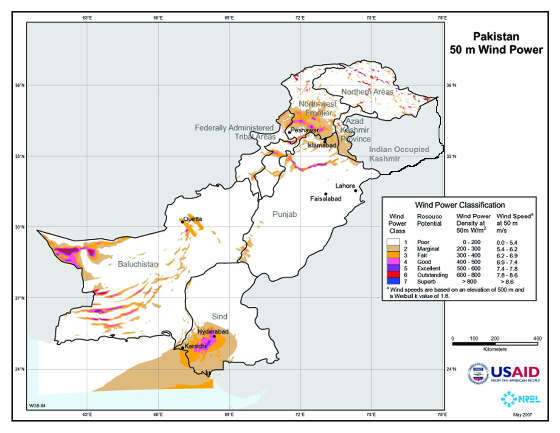 In addition to Karachi and Islamabad, there are other areas in Pakistan that receive a significant amount of wind. In only the Balochistan and Sindh provinces, sufficient wind exists to power every coastal village in the country. There also exists a corridor between Gharo and Keti Bandar that alone could produce between 40,000 and 50,000 megawatts of electricity, about twice the current installed capacity in Pakistan, says Ms. Miriam Katz who has studied and written about alternative energy potential in South Asia. Given this surplus potential, Pakistan has much to offer Asia with regards to wind energy. In recent years, the government has completed several projects to demonstrate that wind energy is viable in the country. In Mirpur Sakro, 85 micro turbines have been installed to power 356 homes. In Kund Malir, 40 turbines have been installed, which power 111 homes. The Alternative Energy Development Board (AEDB) has also acquired 18,000 acres for the installation of more wind turbines. The village of Ghulam Muhammad Goth, north of Karachi with population of 800, about 10 km from the national power grid, now receives power from a small windfarm consisting of 18 wind turbines each capable of generating 500 watts of electricity. Installed by the state-run Pakistan Council for Renewable Energy and Technologies (PCRET), the farm produces enough to power for each home to have two low-energy bulbs, a fan and, most importantly, a television set. In addition to high wind speeds near major centers as well as the Gharo and Keti Bandar corridor, Pakistan is also very fortunate to have many rivers and lakes. Wind turbines that are situated in or near water enjoy an uninterrupted flow of wind, which virtually guarantees that power will be available all the time. Within towns and cities, wind speeds can often change quickly due to the presence of buildings and other structures, which can damage wind turbines. In addition, many people do not wish for turbines to be sited near cities because of noise, though these problems are often exaggerated. Wind turbines make less noise than an office and people comfortably carry on conversations while standing near them. As Pakistan grapples with its crippling energy crisis, it is important for the country to take advantage of its precious natural resources such as the high winds and the bright sunshine, and biofuels as byproducts of its sizable sugar-making industry. Such a strategy will lead to lower costs of generation by reducing the need to import oil. It'll also help reduce carbon emissions, a major environmental concern. Solar energy is a pipe dream. It is not cost efficient, it won't be in the foreseeable future. The BrightSource guys got those contracts on the assumption that oil will hit $200 a barrel. It makes no sense to have a entire swath of land get dedicated to this, only to have no power at night. All homeowners who insalled these systems in California are pissed off. I have looked at this and wind power, another loser for the times to come. Pakistan should hang on to its nuclear dream, the only clean source energy that is financially viable. First, there is nothing more costly that the blackouts and brownouts Pakistani consumers and businesses are suffering on a daily basis. Second, the capital costs of solar and wind will come down rapidly as the incentives in the West ramp up production and adoption. Third, any big central generating plants like nuclear would require munch bigger investments and time to build the plants and upgrade the creaking old grid. Small solar panels and micro wind turbines can be a godsend for the many villages away from the national grid that remain poor, illiterate and backward partly due to lack of electricity. This is nothing short of energy apartheid. Fourth, the nuclear plants will remain a big issue in terms of much larger upfront costs, external political pressures and the danger of serious accidents. A percentage of electricity from such plants may be ok. Finally, the fossil fuel plants are the cost of oil will rise as the supply dwindles and as wind and solar become more cost-effective over the next decade. Riaz-have you heard of the story that says building castles in air??????? Do you not think that our country needs stable democracy and civil society and execute fundamental responsibility of cleaning ourselves of taliban?? ?Research and innovation occur in a nation that has peace in its society-not in nation filled with religious hatred and mullah rulings.We cannot build skyscrapers on pillars of sand-thats what we have done in the last 60 years!!! !Your ideas are good but they do not stand future in a religious nation that is slitting its own throat and cheating the world by forming ties with taliban. I understand and appreciate the point you are making. We have many challenges. The worst response to these challenges is paralysis. We can not serialize these things and keep waiting for one problem to be completely solved before tackling the next one. Such an attitude will definitely doom us, if nothing else does. Pakistan is a big country with lots of people in it. Each Pakistani needs to do what is within his or her power to try and make things better. Pointing fingers will solve nothing. This is a much bigger, a lot more technical matter than it seems on the surface. Wind power can be a sidekick that runs when there is wind. The Altaman pass wind turbines have been stationery for nearly three months since the wind this winter has been below the turbines' cutoff speed. Investments worth several billion dollars are producing zilch. As it is, when there is wind, only 25% of the rated kw is delivered to the grid from these farms. Solar is available at daytime when the power needs are higher at night time. Batteries are not about to come along soon. The laws of fluid dynamics, physics, and gravitation are not about to change anytime soon. Denmark gets 20% of its energy from wind. Germany has the largest solar energy installed based, it's not nearly as sunny as Pakistan. India has done well with wind energy, even though wind speeds in India are significantly lower than Pakistan. Businesses use most of their power during the day and homes use more power at night. A good mix of fossil, hydro, solar and wind can deal with variations in the availability of each at different times. In Pakistani context, it'll be a lot better than the situation it faces today. In any event, the 40% of Pak population that has no electricity and the current power crisis for the rest 60% in Pak calls for a serious response that hurts in daily lives and livelihood. I agree with your sentiments. We need more doers and fewer critics. Thank you for your informative blog. I am curious as to why Shams, Tariq even bother looking at such a progressive blog. They are the reason why Pakistan is so behind. Have you ever heard of the Grameen Bank? They won the Nobel Prize. Do you know what they are now doing? They have created a group called Grameen Shakti in Bangladesh that has brought renewable energy based electricity to hundreds of thousands of people in rural areas not able to access the grid. Solar pv and wind energy are the way of the future. Everybody knows that. You remind me of people in the olden days who used to say that airplanes and railways are pipe dreams! And nuclear?! What a joke! It's incredibly expensive once you internalize all of the safe disposal and containment issues. And please don't talk to me about technicalities- I am a consultant for the World Bank and I work on energy and infrastructure development issues. I am in the process of leaving and starting a non-profit organization to replicate the Grameen Shakti solar pv model in Pakistan because it is the only project I ever reviewed that seemed to make a bit of difference in actually alleviating poverty. SK: "I am in the process of leaving and starting a non-profit organization to replicate the Grameen Shakti solar pv model in Pakistan because it is the only project I ever reviewed that seemed to make a bit of difference in actually alleviating poverty." I agree with you and applaud you for your decision to do something practical help Pakistan. We need more of you, and less of Shams and Tariq. and products you need to start your own solar power project. Interestng article. I will be interested to find out more about your Grameen Shakti type project for Pakistan. Keep us all posted. Thanks for this great post!!!!!!!!!! When you starting the project. i wish to work with you to electrify our remote areas. Good Information Riaz. I appreciate all the people who are interested to make serious efforts to establish renewable energy sources. I believe there should be some group/website dedicated for those who are ready to invest time and money on micro power projects. I'd also request not to discourage people from critizing. Constructive criticism is necessary to bring the best out of any effort. I am interested in helping this cause in bringing solar energy into Pakistan. Does anyone know of a agency already established that is doing this work in Pakistan? Solar Energy and Wind are both clearly viable in Pakistan. Installed cost for medium to large wind turbines could be much lower than indicated by Zorlu Energy. $1.5 Million per Mega-watt installed is generous. We also need to understand that nameplate ratings can be deceptive. The poly-silicon shortage will soon come to an end, as more plants come on line in China. Cost of poly (and mono)crystalline solar panels should soon drop to $2.0-$3.0 per Wp. Installed cost should therefore be on the order of $ 4-5 per Wp. Thin film could be cheaper but more suited to applications where space is less a consideration. Use of alternate energy based electricity would reduce foreign exchange needed to import furnace oil into Pakistan, but also allow the owners and operators to generate carbon credits - already a valuable commodity. i guess this article speaks for my brain/heart felt idea of being able to produce enough power and for chaeap.ive read a review above saying that we should concenterate only on bringing peace to nothern areas---We should not forget that we are talking of a country here not a mere small household where things can be taken 1 at a time.when running country u need to solve unlimited issues side by side. next comes the cost issue--we should not forget that with every passing sec world is loosing oil infact its said that by 2015 tons of oil wells r gonna dry,we r already witnessing signs of crucial times in form of USA fighting in IRaq for oil.the point is oil prices hit roof a little time ago,this time they r gonna hit sky.so we should better prepare now and shift to solar and wind power ASAP. AND MIND IT-- it aint gonna happen in one day or one year.we need plaanning ,infastructure,etc.its probably gonna take a decade to do it if we start from now. So i say lets start NOW!!!!!! Riaz, please pass on my information to your readers. I am the individual who left a message earlier in the year discussing how I will be starting an organization to help bring cost effective solar to the rural poor in Pakistan. After spending several months in Pakistan I have returned to my home in Washington, DC to do just this. It's a non-profit organization called EcoEnergyFinance. (ecoenergyfinance.org)I will be bringing solar energy to rural villages in Interior Sindh. Please contact me at skhan@ecoenergyfinance.org if you are interested in helping in some way. Any of you guys have ever purchased a solar solution for domestic use. I am interested to know how much it costs to get 5KVA power from solar. The new Pakistan Power Report forecasts Pakistan will account for 1.37% of Asia Pacific regional powergeneration by 2013, with a stable theoretical generation surplus before the country’s substantialtransmission losses are taken into account. BMI’s Asia Pacific power generation assumption for 2008 is7,093 terawatt hours (TWh), representing an increase of 3.2% over the previous year. We are forecastingan increase in regional generation to 9,099TWh by 2013, representing a rise of 28.3%. Asia Pacific thermal power generation in 2008 totalled an estimated 5,570TWh, accounting for 78.5% ofthe total electricity supplied in the region. Our forecast for 2013 is 6,999TWh, implying 25.7% growththat reduces the market share of thermal generation to 76.9% - thanks largely to environmental concernspromoting renewables, hydro-electricity and nuclear generation. Pakistan’s thermal generation in 2008was an estimated 62.8TWh, or 1.13% of the regional total. By 2013, the country is expected to stillaccount for 1.13% of thermal generation. For Pakistan, gas is the dominant fuel, accounting for 47.5% of primary energy demand (PED) in 2007,followed by oil at 30.7%, hydro-electric energy at 12.9% and coal with a 7.9% share. Regional energydemand is forecast to reach 4,859mn tonnes of oil equivalent (toe) by 2013, representing 24.9% growthfrom the estimated 2008 level. Pakistan’s estimated 2008 market share of 1.52% is set to ease to 1.45%by 2013. The country’s estimated 2.5TWh of nuclear demand in 2008 is forecast to reach 5.0TWh by2013, with its share of the Asia Pacific nuclear market rising from 0.49% to 0.75% over the period. Pakistan is ranked third behind India in BMI’s Power Business Environment Rating, thanks to itsrelatively high level of renewables (mostly hydro) generation and healthy power consumption/energydemand growth prospects. Several country risk factors offset some of the industry strength, but thecountry is in a good position to keep clear of Malaysia below. BMI forecasts Pakistan real GDP growth averaging 3.98% a year between 2009 and 2013, with the 2009estimate at 2.50%. The population is expected to expand from 161mn to 177mn, with per capita GDP andelectricity consumption increasing by 20% and 11% respectively. Power consumption is expected toincrease from an estimated 81TWh in 2008 to 99TWh by the end of the forecast period, which provides arelatively stable theoretical generation surplus (before transmission losses, etc. ), assuming 4.3% annualgrowth in electricity generation. Between 2008 and 2018, we are forecasting an increase in Pakistani electricity generation of 59.2%,which is mid-range for the Asia Pacific region. This equates to 27.2% in the 2013-2018 period, up from25.1% in 2008-2013. PED growth is set to increase from 19.1% in 2008-2013 to 25.8%, representing49.9% for the entire forecast period. An increase of 49% in hydro-power use during 2008-2018 is a keyelement of generation growth. Thermal power generation is forecast to rise by 52% between 2008 and2018, with nuclear usage up 380% from a low base. More details of the long-term BMI power forecastscan be found at the end of this report. The thing that worries me the most are the government policies on the issue of solar power for individual homes. how does an architect involved with planning and designing huge areas of land for buildings in govt sector, can collaborate with energy alternate policies taking shape and their actual incorporation within those areas during the design stage? inspite of having all the funds to run and maintain these buildings how can alternate energy be made useful for the end gains? should we use these alternate energy generation features for our own area and buildings or do we incorporate these alternate geneartion features in our design and supply them to the nearby villages?? I think there is a lot of work being done in solar and green building designs in the US and Europe that includes active and passive solar designs of buildings and campuses. You can probably find a lot more on it by doing online searches on Google or Bing. "I see the cost of [solar] photovoltaics going down and down. Right now it's about $4 per watt for full installation. In a decade it will certainly be less than $2. If it's $1 or $1.25, then everyone will put it up without subsidy. What else do I see? A new generation of biofuels that are direct substitutes for gasoline—so, better than ethanol—using agricultural waste: weed straw, rice straw, corncobs, wood surplus." "We're at about 4 percent now (renewables sources). President Obama made a target to double that by 2012, and we are on target. I expect that to continue. In 10 years' time we hope to have carbon-capture-and-sequestration technologies starting to be deployed. Hopefully, we'll have restarted the nuclear industry and we'll be building several nuclear reactors." yield, according to recent studies. But it is also a country where 412 million of its 1.1 billion people live without electricity, faces an energy deficit of 16 per cent and needs power desperately to drive its high economic growth. Aiming for long-term energy security, the government has unveiled plans to boost solar output almost 1,000-fold to 20,000 megawatt by 2022. The 'Solar India' initiative, to be implemented by the Ministry of New and Renewable Energy, would power cities and rural areas and could revolutionize the domestic solar-energy industry. Fossil fuels currently account for 70 per cent of India's energy mix, while renewable sources provide about 9 per cent. 'Given the ground realities, major challenges include effective financing, advancing R&D in technologies for solar modules and components and human resources like training engineers and technicians,' said Rajinder Kumar, secretary general of the Solar Energy Society of India. 'We have to bring in a balance of system, distribution and maintenance to realize our solar dream,' Kumar said. required for the three-phase programme is around 50 billion dollars, of which the government would contribute about 40 per cent. There is little clarity on where the remainder should come from, with Indian expecting that rich countries with a responsibility to assist renewable projects in the developing world would provide the funding. The strategy currently framed would include a long-term policy to purchase power and shift subsidies from fossil fuels to renewable-power generation. 'We need to reduce high-initial costs for solar-power generation and build grids of scale to allow rapid diffusion of solar technologies and large-scale domestic manufacture of equipment,' renewalbe energy ministry spokeswoman Prabahvati Akashi said. The ministry says there is 'tremendous interest' from companies and entrepreneurs for the pilot programme based on feed-in tariffs. Following a recent launch of small commercial solar farms, the Clinton Foundation is setting up 3,000- to 5,000-megawatt (MW) solar energy parks in northern Rajasthan. Solar Energy is the only solution for Pakistan. The holy Sun is Free as well as pollution free, but the system should be of required need and affordable. I have a Solar Energy Co. in the USA. Anyone can contact me at my e-mail, which is subedar486@yahoo.com. In Silicon valley recently, the US federal government has pumped in about $500 million each into two green tech startups..Solyndra pv solar and Tesla all-electric cars. Obama was here this week to promote green tech and spoke to Solyndra employees. In addition, there is $1 billion in federal grants being offered to biotech firms under the new healthcare bill. The reason for US supremacy is partly explained by how much of its public funds it spends on higher education. A 2006 report from the London-based Center for European Reform, "The Future of European Universities" points out that the United States invests 2.6 percent of its GDP in higher education, compared with 1.2 percent in Europe and 1.1 percent in Japan. Enough talk , How can an Electrical Engineering student help ? Due to continuous Shortage of Electricity in Pakistan, we have started thinking of Alternatives like SOLAR ENERGY to be a workable solution to meet up the growing Electricity demands in Pakistan. We are of the view that there is a future; where Solar Power will be an essential component of the Global Power Generation mix. The Technologies for Solar Power has been improved by passage of time particularly in USA and Europe there are a number of companies which has developed the latest and proven Technology and are in a process of implementation of Utility Scale Solar Power Projects. We are focusing on developing First clean energy Project in Pakistan to meet country’s ever increasing demand for power. The group is currently working on setting up of a Solar Thermal Integrated Power Project using the CSP Technology first time in Pakistan. We are also keenly looking forward for cooperation in Rural Electrification by Use of Solar Technology in Pakistan. Please send us detail on it as well. Thanking you and looking forward to expatriate Pakistanis in particular who are interested in joining us for an Utility Solar Power Projects in Pakistan. At Solar Systems Pakistan, our quality products and unmatched service have made us the solar energy leader for homes, businesses and government agencies across the country. No matter what the size of your project, we deliver equipment tailored to your power and cost requirements. Visit www.solarsystemspk.com for more details. The U.S. Department of Energy (DOE) has unveiled initiatives aiming to make solar power as cheap as fossil fuels, and stimulate 10 GW of offshore wind development, in the next decade. The DOE said the solar initiative, dubbed as a “sun shot” by energy secretary Steven Chu – in reference to John F. Kennedy’s “moon shot” goal of landing a man on the moon in the 1960s – would reduce the cost of solar power by 75 percent. Chu said that would put the price of installed solar power at about $1 per watt, or about six cents per kWh, and allow solar energy systems to be broadly deployed across the country. “That would make solar energy cost-competitive with other forms of energy without subsidies of any kind,” Chu said, according to Reuters. The initiative includes $27 million awarded to nine projects to support the development, manufacturing and commercialization of solar energy technologies. The DOE and Department of the Interior yesterday also announced up to $50.5 million for projects that support offshore wind energy development, and identified several high-priority Wind Energy Areas (pdf) in the mid-Atlantic. The areas are offshore of Delaware (122 square nautical miles), Maryland (207), New Jersey (417), and Virginia (165), and will receive streamlined reviews to lessen the time for project approval and leasing, the DOE said. The Department of the Interior said it could offer leases in these areas as early as the end of 2011. The Interior said it hopes to identify Wind Energy Areas off of north Atlantic states, including Massachusetts and Rhode Island, in March. The department said it will carry out a similar process for the south Atlantic region, especially North Carolina, this spring. The $50.5 million, spread over five years, is aimed at developing breakthrough offshore wind technology and removing market barriers. The departments also published a joint plan called the National Offshore Wind Strategy (pdf). The plan calls for deploying 10 GW of offshore wind by 2020 and 54 GW by 2030, with development in both oceans, the Gulf Coast and the Great Lakes. The plan focuses on three key challenges to offshore wind: the high cost, technical challenges, and lack of site data and expertise with permitting processes. Much pleased to read all this. just ignore those are saying its dream and not feasible.. in fact some people cannot digest good things happening in our country. Sloar and wind energy can be used in many areas in Pakistan, and already in use. Nuclear energy too important for industrial growth. I would like to go ahead with solar power for my home. Can someone offer me a tangible solution for Lahore. ISLAMABAD: Asian Development Bank (ADB) will launch the Asia Accelerated Solar Energy Development Fund with $2.25 billion as it targets solar power projects in countries including China, India, Pakistan, Uzbekistan and Thailand to add another 1,000 megawatts next year and 1,500MW in 2013, said a statement of the ADB. “By providing an enabling environment for commercial lending and private investment in the solar energy market, we hope to encourage its rapid growth and bring solar energy nearer to grid parity-making solar energy competitive in price to conventional sources,” ADB President Haruhiko Kuroda said at a clean energy forum in Manila. Asia needs to invest around $10 billion in the next few years to make solar power generation competitive with conventional energy sources and called for radical steps to fight climate change. ADB wants Asia, home to about two-thirds of the world’s population to add 3,000 megawatts of solar energy capacity by the end of 2013, he added. Already this year, it has helped countries add 500 megawatts, doubling the region’s solar capacity. Fast-growing Asian economies rely heavily on fossil fuels. ADB has forecast Asia-Pacific imports of fossil fuels will more than double between 2005 and 2030, with oil accounting for more than 90 percent of such imports. “The total cost of this 3,000 MW is about $10 billion, of which we are planning to commit $2.25 billion,” sais S Chander, Principal Director at ADB’s Office of Information Systems and Technology. “Our job is to catalyse enough projects to increase volumes and to make sure that the manufacturers (of low-carbon technologies) have an incentive to invest in research and development,” Chander said. ADB invested $1.76 billion in clean energy across 29 projects last year and said it is on track to meet a goal of $2 billion in clean energy investments annually by 2013. It plans to inject $60 million into three venture capital funds that will provide early-stage financing support for new climate technology products. It expects this initiative to leverage over $400 million in private sector investment. The sun strikes every square meter of our planet with more than 1,360 watts of power. Half of that energy is absorbed by the atmosphere or reflected back into space. 700 watts of power, on average, reaches Earth’s surface. Summed across the half of the Earth that the sun is shining on, that is 89 petawatts of power. By comparison, all of human civilization uses around 15 terrawatts of power, or one six-thousandth as much. In 14 and a half seconds, the sun provides as much energy to Earth as humanity uses in a day. The numbers are staggering and surprising. In 88 minutes, the sun provides 470 exajoules of energy, as much energy as humanity consumes in a year. In 112 hours – less than five days – it provides 36 zettajoules of energy – as much energy as is contained in all proven reserves of oil, coal, and natural gas on this planet. If humanity could capture one tenth of one percent of the solar energy striking the earth – one part in one thousand - we would have access to six times as much energy as we consume in all forms today, with almost no greenhouse gas emissions. At the current rate of energy consumption increase – about 1 percent per year – we will not be using that much energy for another 180 years. The cost of solar, in the average location in the U.S., will cross the current average retail electricity price of 12 cents per kilowatt hour in around 2020, or 9 years from now. In fact, given that retail electricity prices are currently rising by a few percent per year, prices will probably cross earlier, around 2018 for the country as a whole, and as early as 2015 for the sunniest parts of America. A renewable energy initiative led by Pakistan Engineering Council chairperson and PPP senator Rukhsana Zuberi is installing solar panels on many public buildings in Islamabad and elsewhere in Pakistan. She is an NED University mechanical engg alum. Click here to see details of the program. Asian Development Bank (ADB) has said it will launch the Asia Accelerated Solar Energy Development Fund with $2.25 billion as it targets solar power projects in countries including China, India, Pakistan, Uzbekistan and Thailand to add another 1,000 megawatts next year and 1,500MW in 2013. “By providing an enabling environment for commercial lending and private investment in the solar energy market, we hope to encourage its rapid growth and bring solar energy nearer to grid parity – making solar energy competitive in price to conventional sources,” ADB President Haruhiko Kuroda said at a clean energy forum in Manila on Wednesday. He said Asia needs to invest around $10 billion in the next few years to make solar power generation competitive with conventional energy sources and called for radical steps to fight climate change. He said ADB wants Asia, home to about two-thirds of the world’s population, to add 3,000 megawatts of solar energy capacity by the end of 2013. Already this year, it has helped countries add 500 megawatts, doubling the region’s solar capacity. Fast-growing Asian economies rely heavily on fossil fuels. ADB has forecast Asia-Pacific imports of fossil fuels will more than double between 2005 and 2030, with oil accounting for more than 90 per cent of such imports. “The total cost of this 3,000 MW is about $10 billion, of which we are planning to commit $2.25 billion,” S Chander, Principal Director at ADB’s Office of Information Systems and Technology, told reporters. Pakistan will announce its first tariff policy for clean-energy producers next month, offering premium payment rates as it seeks to attract investors to help overcome power shortfalls. The country has given approval to 30 companies to install wind plants with an estimated capacity of 1,500 megawatts, said Arif Alauddin, chief executive of the state-run Alternative Energy Development Board. “There will be a feed-in tariff based on a cost-plus approach,” he said in an Aug. 23 interview at his office in Islamabad. The tariff policy “offers an extremely good rate of return,” with most of the risks covered by the government, he said. Developers may be able to get as much 18 percent returns on their investment, he said, declining to say what the feed-in tariff rates will be. Pakistan is seeking to diversify its energy supplies away from oil and gas and boost electricity production. The nation has a power deficit of 3 to 4 gigawatts a day, or more than the output of two nuclear reactors, triggering 12-hour blackouts that cause riots and close factories in cities nationwide. The feed-in tariffs will speed the development of projects in the pipeline, Alauddin said. Companies that are close to achieving financial close include Zorlu Enerji Elektrik Uretim AS (ZOREN), a Turkish power utility, China International Water & Electric Corp. and Fauji Foundation’s two plants in Sindh province, he said. Pakistan has almost 1 gigawatt of wind-power projects under construction or with financing agreed upon and 498.5 megawatts more of plants announced, according to Bloomberg New Energy Finance data. Only 6 megawatts of wind-energy facilities are operating in the nation. Commercially exploitable wind exists in many parts of Pakistan, especially in Sindh and the coastal area of Balochistan. Zorlu Enerji’s project is Pakistan’s first privately owned and financed wind farm. Pakistan is the ninth-poorest country in the Asia-Pacific region with a 2009 gross domestic product per capita of $2,609, according to Bloomberg data. Its fight with Taliban militants in the tribal areas bordering Afghanistan, a debt pileup among energy companies and unwillingness of banks to finance power projects are creating some “barriers” for potential investors, Alauddin said. “The engineering, procurement and construction cost and the turbine cost that are offered to Pakistani investors appear to be higher than what is being offered elsewhere in the world, maybe 20 percent to 25 percent higher,” he said. Pakistan is seeking to derive at least 5 percent of its energy from renewable sources by 2030, the development board said in March. Last year, 53 percent came from natural gas, 30 percent from oil and the rest from coal, nuclear and hydropower, according to data from BP Plc. The London-based oil company didn’t measure the sources of renewable energy there. The Pakistani government first launched a FIT in 2006, but the package bore little fruit and the country still has just 6MW of operational wind capacity. The new FIT is aimed at jump-starting renewables in a nation that faces a 3-4GW energy shortfall, made worse by the devastating floods in 2010. In sharp contrast to Pakistan’s paltry wind portfolio, neighbouring India had more than 13GW installed at the end of 2010, according to the Global Wind Energy Council. While Islamabad has not spelled out the new FIT rates, a spokesman for the state-run Alternative Energy Development Board says investors will be able to net internal rates of return of up to 18% under the new support regime. The government has already given the go-ahead to 1.5GW of projects, with several developers near to reaching financial close. These include Turkish utility Zorlu Enerji and China International Water & Electric. Zorlu Enerji’s 49.5MW project near Hyderabad will be Pakistan’s first privately-owned wind farm. In 2010, for the first time, more wind capacity was added in emerging economies than in the traditional wind markets in the OECD countries. Industry figures say attitudes towards wind energy have shifted dramatically in developing countries like Pakistan in recent years, as officials come to grips with the immense opportunity wind brings for rapidly adding generation capacity. Pakistan has a target of a 5% share of power from renewables by 2030. ..That would be solar thermal power, which harnesses heat from the sun and converts it to steam to make electricity as the need arises, especially when the sun has disappeared behind a cloud or dropped below the horizon. Electricity is unique among major commodities in that it must be produced and consumed simultaneously. It can be stored in a battery, of course, but for now, that technology’s costs are so high that batteries are used mostly to smooth out production from renewable sources, not to save it for later. The economics of a plant that can store bulk amounts of energy are a bit arcane. At the simplest level, the idea is to gather the sun’s heat when it is available and save it until prices for electricity reach a peak. At the moment, though, prices peak when the sun is high in the sky, because that is when the demand for power, mostly for air-conditioning, is highest. Some experts think it will be years before the power system is so saturated with solar photovoltaics that thermal storage becomes worthwhile. “As the world exists now, what you’re doing with storage is taking high-priced peak potential generation and moving it to off-peak,” said George Sterzinger, director of the Renewable Energy Policy Project, a nonprofit group in Washington. But one solar thermal plant with storage is already in service, near Seville, Spain. Built by Torresol Energy, the plant is small, just under 20 megawatts. And four are in construction or on the drawing boards in the American Southwest, as I explained in my article. Their backers are betting that photovoltaics will get cheap and will drive down the price of electricity in daylight hours. But there are other reasons that energy storage might be a good deal from a financial point of view. One is that the two biggest forms of renewable energy, wind and solar, have a tendency to gear up and then fall off very quickly, at least by the standards of conventional generators. If the rest of the system has to respond, then a lot of plants running on coal or natural gas would have to increase their output or cut it very quickly. If the fraction of energy derived from renewable sources is small, that’s not a big problem; if solar makes up, say, 2 percent of production, and if it falls by half in a few minutes, the rest of the system can compensate. But if solar makes up 20 percent, the potential problem gets bigger. Worth even more is the value of a source that can be counted on to produce when needed, as opposed to when the sun is shining; that’s worth 0.7 cents to 2 cents, he calculated. There are other ways to store electricity, but all of them incur costs, both for equipment and the energy. The “round-trip efficiency” of a solar thermal system – that is, the ratio of energy recovered compared with the energy invested – is in the range of 95 percent. That’s far higher than the ratio for the biggest conventional form of storage, pumped hydro, which involves pumping water up a hill and letting it turn a turbine to make electricity on the way down later. Another technique is storing energy by compressing air. But with either of these, the energy being stored might have come from a coal-fired plant, which will not help the environment or help a utility meet its quota for renewable energy. Pakistan starts 2012 on a slightly brighter note after a year of recovering from the worst floods in the country’s history in 2010 (while continuing to endure high levels of terrorism-related violence). As part of the effort to rebuild, sunny days and solar panels and multipurpose lights are providing reliable and much needed electricity for schools and rural areas of Pakistan that have been without electricity since the floods. Plan International Pakistan and the Punjab education department have rehabilitated nearly 400 schools destroyed by floods, and implemented solar power in 250 schools that did not have electricity. Funded by the United Kingdom’s Department for International Development (DFID), the project piloted the first use of solar technology in the UK’s disaster response. In addition to the solar panel installation, the project also provided water and sanitation, school furniture, school paper, schoolbags and uniforms, sports equipment and health education for 54,000 primary school children. In addition to powering up the schools, aid from the U.K.’s DFID also provided multipurpose solar light units to people across rural southern Pakistan who have been without power since the floods and were relying on candles, kerosene oil and rechargeable flashlights for light. The solar unites provide free and sustainable light for up to 10 hours after charged and last up to five years. But beyond providing light, the units can also be used to recharge mobile phones, which play a critical role in helping displaced families and communities stay connected in areas where landline phones are rare. Riaz Haq you are doing great to electrify our beloved nation. Do concentrate on remote areas too where darkness has fallen on poors. May God give you more strength to fight against this poverty rid nation. Arif Allaudin, who heads the Alternate Energy Development Board, would like to see more of that help coming from renewable sources, saying there was a 2.4 million megawatt potential for solar energy alone in Pakistan. Niaz Ahmed Kathia, director of private company Alternate Energy Systems, said abundant and free sunshine was the answer to Pakistan's energy woes. "Energy is our biggest issue, more than terrorism, and if we replace our one million tubewell pumps with solar ones, we can save 7,000 megawatts," Kathia told AFP at the demonstration of a solar well in the capital. The majority of Pakistan's tubewell pumps, which pump out underground water, run on the strained national grid or on diesel power. There is no pretence that solar power is the only answer, but this month the prime minister ordered the government to provide solar electricity in remote villages far from the national grid. The government described renewable energy as the "investor's choice" and said the private sector has offered to produce 1,500 megawatts a day. In the mountains of Kashmir there is no gas pipeline and in the cold winter months electricity bills are prohibitively expensive. In Azam's hometown of Muzaffarabad, the capital of Pakistani-controlled Kashmir, solar panels light up a public park and mosques. Solar street lights are also being installed slowly in cities such as Rawalpindi, Lahore and Karachi. Pakistan's first on-grid solar power station, capable of producing 178.9 kilowatts, began test operations in Islamabad this month with a grant of $5.4 million from the Japan International Cooperation Agency. "It is a seed for thousands more solar power plants," Senator Rukhsana Zuberi, a former chairperson of the Pakistan Engineering Council told AFP. This winter Pakistan suffered a two billion cubic feet a day shortage of natural gas -- usually the mainstay of millions delivered to homes and industry via pipelines -- sparking protests and forcing factories to lay off labourers. "We plan to promote the use of solar geysers as the gas shortage is becoming acute," petroleum and natural resources minister Asim Hussain said. "The gas companies would install solar water heaters at consumer premises and deduct the amount in installments in the gas bills," he added. Power generated during sunlight hours can be stored in deep cycle lead acid batteries to power lights, radios, televisions and fans at night. Norwegian company Telenor says it has set up 50 solar-powered cell sites, mostly in remote areas, capable of reducing 2.5 tonnes of carbon dioxide per site by saving over 940 litres of diesel a month. Traders say demand has certainly risen. A 170-litre (37-gallon) capacity solar geyser starts from 27,000 rupees ($300) and a 218-litre version for 32,000 rupees as a one-time cost. "Solar geysers can reduce gas bills considerably. The technology is not only environment friendly but also pocket friendly," said vendor Shakil Ahmed. Syncronys International has announced it has received an order valued at US$4.5 million to install 400 solar powered well pumps in Pakistan. Although financing and insurance is still pending, the company envisions around 9,000 additional solar well installations throughout the region over the next three years. Syncronys offers a comprehensive product and technology strategy to provide a wide range of green energy applications, Micro Utility, Micro Grid and Smart Grid initiatives on any domestic and international level. I am from Turkey and my boss is Pakistan. I am willing to help and do something for Pakistan with my boss. I wonder if you help me to contact with any people who really would like to work in solar energy sector with us. I am extremly excited about solar energy we should so something nice for us and for future generations. Otherway they will not find anywhere to live in. And also i would like to say big Thank you for your blog. To read and learn many things about Pakistan is so wonderful. Thanks again. Global R&BD Division of CX Korea has informed after completion of formalities of NEPRA, Ministry of Water and Power etc their company would initiate project of establishment of 10 mw solar energy plant, which would later be extended upto 300 mw power generation through solar energy. A four-member delegation of CX Korea Inc related to solar energy project, led by its Executive Director, Ko Young Sun informed CM Sindh Qaim Ali Shah the 10 mw plant would be ready by December this year and firstly the plant would be extended upto 100 mw while later it would be extended upto 300 mw by 2015. Sun said Germany and Korea have made good achievements in solar energy and Korean Global construction would fulfill the requirements and initiate and complete the project as per commitment. He informed KAPCO-Daewoo Engineering would provide project financing and for the purpose. They required 1200-acre land for 300 mw project as the project need four acre land per one mw power through solar energy. Qaim Ali Shah said the provincial government has made arrangements for provision of infrastructure and facilities to the investors. excellent topic and it resonates my feelings. Renewable like solar are new and it takes time to understand and use them and hence we need people who knows electrical engineering and those who have the passion to make things work. I am an electrical engineer from Canada and I would love to collaborate on this issue. The 50-megawatt project at Bahawalpur in the Cholistan region is owned by DACC Power Generation Co. and the Pakistani government and will supply 30,500 households with electricity, Conergy said today in an e-mailed statement. Total investment will probably be about $170 million to $190 million, with Conergy’s share at about 60 million euros ($75 million) to 70 million euros, said Antje Stephan, a Conergy spokeswoman. The government is seeking to spur investment, create jobs and expand access to power in a country where some areas can be without energy for as long as 18 hours a day, Conergy said. The company, working with developer Ensunt Inc., will supply 210,000 modules and 140 inverters, the Hamburg-based manufacturer said. Board of Investment (BOI), Government of Pakistan and Concentrix Solar Company of Korea Wednesday signed a Memorandum of Understanding (MoU) to construct a 300 MW Solar Energy Plant near Quetta, Balochistan. The MoU was signed by M. Saleem Mandviwala, Chairman Board of Investment from Pakistan side and Dr. Choi Moon-Sok, Chief Executive Officer Concentrix Solar Company. The signing ceremony was held at the PM’s Secretariat which was witnessed by Prime Minister Raja Pervaiz Ahsraf, Federal Ministers and Chief Ministers of Balochistan and Sindh. Concentrix is a subsidiary of German Company and is keen to make investment in the energy sector in Pakistan. Dr. Choi Moon-Sok met the PM yesterday and apprised him of his company’s plans. CX Solar Korea is leading a group that signed an agreement with the government of Pakistan to build a 300-megawatt solar farm that will require an investment of as much as $900 million. The group plans to start a 50-megawatt installation near Quetta in southwestern Balochistan province that will use a combination of crystalline silicon and thin-film panels to see which perform best, said Moon-sok Choi, chief executive of CX Solar, a Seoul-based project developer. The group expects to build 300 megawatts by 2016, Choi said. The power will be sold under a 25-year contract, with details still being negotiated, Choi said in an e-mailed response to questions. CX Solar is in talks with panel suppliers, including Bernin, France-based Soitec SA (SOI), which makes Concentrix photovoltaic panels, Choi said. A technical training workshop on ‘Solar Pumping System’ was organised by Institute of Space Technology (IST) here on Friday in collaboration with M/s Lorentz a leading manufacturer of solar-operated pump systems in the world and Nizam Energy Pakistan. A large number of people from government, Research and Development organisations, HEC, universities, students and faculty attended the workshop. Participants showed keen interest in the workshop and the products presented by the companies. The first of this series of workshops, ‘Solar Energy — A sole Savior’ was organised on November 16 in collaboration with M/s Canadian Solar and Nizam Energy Pakistan. The purpose of these workshops was to discuss strategies for creating awareness which encourages wider adoption of solar power by businesses, households and agriculture etc. There are various options for the solution of energy crisis which include building dams a time consuming process, wind energy is available in some corridors, however, there is no dearth of sunlight which is not only abundantly available but Pakistan has some of the best irradiation in the world, yet we are amongst the slowest to take advantage of this God gifted source. IST Vice Chancellor Engineer Imran Rahman while welcoming the delegates and experts from world renowned enterprises in solar energy apprised the audience about possible co-ventures with international companies in order to make available import substitution through research and indigenisation of some important components, a dire need of the time for promotion of industrial-academia culture in the country. The vice chancellor thanked Nizam Energy CEO Usman Ahmed for generous donation of 2 KW of complete solar system and to establish research lab facilities at IST in collaboration with world renowned companies and provide job opportunities to IST graduates. KARACHI - Pakistan still has thousands of villages that are not electrified and routine activities of villagers therein are limited to sunlight. Nevertheless, in a unique project, 115 households of Jhimpir area of Thatta district have been electrified through solar energy. The project has been implemented by the Centre for Environment & Development (CEAD) with the support of the USAID’s Ambassadors Fund Programme. The villages covered by the project are off grid and received electricity for the first time through solar systems. The area has moderate weather and average sunshine availability ranges from six to eight hours. The area is most suitable for the use of 40-watt solar house system that fulfils the requirements of the average household size for about four to five hours during the night time. Each solar unit consists of two energy savers of eight-watt, one for room and one for courtyard, and one portable emergency light to be used during night-time, one mobilephone charger to charge mobile phones that help the beneficiaries to have effective communication.CEAD Chief Executive Prof Qalander Shah said that people residing in far-flung and off-grid areas still used kerosene lamps and other forms of energy, especially during night-time for their security as well as of their livestock and other belongings. However, these communities use kerosene lamps for only a couple of hours because kerosene oil is costly and harmful for health as smoke emitted by it causes asthma and eye-related diseases.Observing that all economic activities were directly dependent on energy, CEAD Director Dr Ali Murtaza Dharejo and said that with provision of 115 household solar systems, life of Jhimpir families would be changed. The solution is long lasting and sustainable as it is based on renewable resources. He said that solar energy was not only cost-effective but also environment-friendly and was without any operation and maintenance cost. He said that the provision of solar systems at the household level would certainly bring far reaching benefits to communities, who earlier had no source of electricity. He added that the use of kerosene oil for lighting brought many health problems and as a result, poor people in rural areas were struck down with many diseases. German renewable energy company CAE plans to invest more than €100 million (Rs12.9 billion) in setting up the first solar panel manufacturing facility in Pakistan, and the second of its kind in Asia. In an exclusive interview with The Express Tribune, Shahzada Khurram, the only Pakistani director of the company, shared its plans of becoming a leading supplier of renewable energy equipment in the country. “Pakistan is going through one of the worst energy crises, and it is time to think about renewable energy as a way to make good money in the sector,” said Khurram. CAE, based in Germany, is owned by four partners, one of whom is Khurram. The other three are Renier Kertess (German), Anton Josef Hotz (Swiss), and Luigi Tassell (Italian). Khurram met them during his time as a student in Germany and Mexico. Khurram himself is from a family that has a background in textile manufacturing. CAE plans to introduce a type of solar panel that has not been used in Pakistan before and is not manufactured anywhere else in Asia except one place in China. It will build a factory in Faisalabad on land that has been given to it by the University of Agriculture Faisalabad. In exchange, the university gets a 10% share in the company’s Pakistani subsidiary. Manufacturing is expected to start by the end of the year. 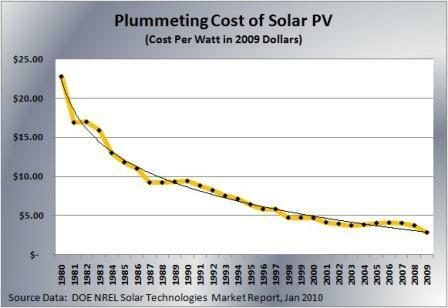 Solar energy prices are rapidly becoming more competitive with thermal energy sources. Several global experts believe that 2013 will be the year that solar energy becomes economically viable even without any government subsidies. The problem with solar panels in Pakistan has hitherto been the fact that the upfront set-up cost is beyond the reach of most customers, even though the costs thereafter are miniscule. To smooth out that the cost curve, CAE has partnered with Faysal Bank and Meezan Bank to offer consumer financing options for people looking to install solar panels in their homes and offices. CAE claims it will offer a 25-year warranty for its products, allowing its customers to get extended time periods on their loans, which will reduce monthly payments. Nizam Energy is an importer and Distributor of TIER-1 Solar Components in Pakistan, we have a nationwide network of offices for Service Support. ... There are over 10 million households in Pakistan without electricity. These households spend at least 750 million dollars a year on kerosene for lighting. For 1.2 billion dollars, which is about worth 18 months of kerosene bill, each one of these households can get a solar energy system. The payback period is eighteen months, and if the households were to regularly pay back to the providers what they saved on kerosene, the provider would make a ton of money within two years. It's a good business, a big business, a two billion dollar business, it's just sitting there - it's simple economics," he (Carl Pope) elaborated his point further. Carl (Pope) told BR Research that a major purpose of his visit to Pakistan was to further explore this idea of solar power provision to rural households that are off the electric grid. "People have tried similar models on smaller scale in Africa and India. In this model, three things are required: a) a bank to provide financing, b) reputable distributors and supply-chain/logistics companies that make sure that the product that is being provided (solar panels) is a good product, that it will actually work, and c) somebody willing to provide the first-loss guarantee to the bank. If you get the last two together, they can get the bank. I have met some landlords on this visit to Pakistan, I have visited a set of villages near Dera Ghazi Khan, and I have also talked to people who are not landlords, but have business interests." Carl pointed out that the finance problem in this model - the inability of the rural households to pay for these solar installations - can be addressed when somebody is willing to bank. "Bankers are uncomfortable because these households are generally poor; and bankers are also uneasy lending to this segment because they usually don't know anything about solar power. But there is an opportunity that might exist in Pakistan. For better or for worse, Pakistan has a large number of landlords, who know how to collect money from their tenants. If you go to a landlord, and say 'look, you have got 25,000 people in your area, wouldn't you like them to have electricity? It wouldn't cost you anything; you only have to collect repayments from your tenants who, with electricity, would become more productive, which could also raise your rents (income)'. Landlords are proud people, and if their ability to control their tenants is manoeuvred in this direction, they may take interest. To make this idea work, the landlord will have to agree to provide the bank with a first-loss guarantee," he explained further. Carl Pope cautioned that such a model cannot be scaled through a philanthropic venture - businesses have to be involved because the idea makes business sense. "I personally think that the rural adoption of such a product would depend more on awareness of product functionality and reputation of the provider. It will take time, yes, but I don't really see any other option for these rural households. Reality is that most of these villages are never going to get wired, because they weren't anybody's priority in the first place. On one hand, the price of wiring a village has gone up fivefold in last five years, because of the rising prices of copper and other items. In most cases, the copper wire that is strung to a village is worth more than the electricity sold to the villagers. Moreover, the power demands of cities and industries are growing faster than the supply of electrons to the grid. So there isn't extra power to give to such villages," he observed. The solar company Phaesun GmbH from Memmingen has installed 200 solar water pumping systems in 12 districts in Pakistan. The latest systems were successfully put into operation together with the Pakistani partner Izhar Energy by December 2012 in the district of Sukkur. The project has been initiated and financed by the United Nations Development Programme UNDP to counteract the destructive tidal flood in Pakistan in the summer of 2010. Thousands of families will benefit from the project that secures the water supply for drinking water, irrigation and livestock farming. The people in Pakistan still suffer from the devastating consequences of the flood disaster in 2010: Thousands of people lost their lives, 6 million people urgently needed humanitarian aid, the infrastructure was severly damaged in many parts of the country. Even the water supply was disastrous in many places. Clean drinking water was often only available after having covered long distances. Organised water supply for agriculture and livestock farming was often not existent in many places. The UNDP-project aims at a sustainable water supply for local communities by means of renewable energies. In twelve districts of Pakistan, local communities have been identified where the water supply was almost completely disrupted. The 200 solar water pumping systems have been individually sized according to the needs on site such as water amount and pumping head and were installed from November 2011 until December 2012. 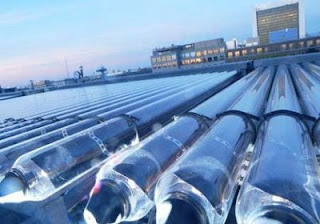 The systems use pumps of the manufacturer Grundfos which are operated with solar modules between 400 and 700 watts. Russom Semere, managing engineer at Phaesun reports: "It was an enormous logistical effort to realise that project. The infrastructure in many regions of Pakistan has not yet been rebuilt. The components often had to be taken to their point of destination with the help of donkey carts and boats. The project could be realised in the first place due to the cooperation with the local partner Izhar Energy and the UNDP members on the spot!" The project has a sustainable effect on the development of the affected regions. "The local communities are enthusiastic and grateful," Faiz Butta, managing director of the Pakistani solar company Izhar Energy reports. "They are now responsible for the operation of the pumps. During the time of installation, we carried out detailed training courses for the local community authorities. "When we visited systems we had already installed the year before, I could convince myself that they have been perfectly maintained and serviced. The responsible authorities are aware of the fact that the economic development of their communities depends on the water supply of agriculture and livestock farming." The UNDP initiated and financed the project, Phaesun sized the systems, prepared and supplied the components. The logistics and installation on site was organised together with the local partner Izhar Energy. A Memorandum of Understanding has been signed between the Balochistan government and CK Solar Korea for installing a 300 MW solar power plant near Quetta, Provincial Secretary Energy Fuad Hashim Rabbani said on Saturday. The project will cost around $900 million and will be completed by 2016, he said, while addressing the media. Rabbani said the government has procured 1,500 acres of land in Khuchlak and Pishin on lease. “This project will help overcome the shortfall of electricity in Balochistan,” he added. The project will provide green energy particularly in areas where is no conventional electricity option, the energy secretary said. “Currently, the local population of targeted areas are using kerosene lanterns, which is hazardous to the health and non-economical due to the intermittent price hike,” he remarked. He said that electricity to medical facilities such as hospitals, Basic Health Units and installation of solar street lights were amongst major benefits of the project. “The government is planning to install 20 solar powered water pumps in 10 districts of Balochistan for water supply schemes,” Rabbani said. Responding to a question, he conceded that farmers were suffering due to long hours of load-shedding and assured that steps would be taken to provide electricity to the farmers. He said that work on Loralai-DG Khan 220 KV and Dadu-Khuzdar 220 KV power supply lines would be completed next year. Working with local and international partners like Coca-Cola, China Mobile's Zong, the Imran Khan Foundation and Engro Corporation, Pakistan's Buksh Foundation has set a goal of illuminating 4,000 off-grid villages by 2017. The village of Chak 113, in Punjab's Sahiwal District, installs its new lantern charging station. As part of a pilot project to increase the use of solar power, the Lahore-based microfinance institute Buksh Foundation and the Energy and Resources Institute (TERI) in India, working with national and international partners, have electrified 72 off-grid villages in Pakistan's Punjab province. The Buksh Foundation, launched in 2009 by Pakistani retail giant Buksh Group, has sought to increase financial inclusion for rural and peri-urban population. The organization has launched a unique solar energy access model, Lighting a Million Lives, which aims to provide energy access to rural un-electrified areas of Pakistan. Lodhran, Dera Ghazi Khan, Dera Ismail Khan, Bahawalpur and Chiniot have already been electrified, with 70 more in the pipeline for this month, further reaching out into Mardan, Khushab, Gujrat, Kasur and Bahawalnagar in a period of only six month," Anam Elahi, the Buksh Foundation's business development manager and head of the Lighting a Million Lives project, told pv magazine. The project has already impacted some 25,000 people and the Buksh Foundation is planning to light a total of 4,000 Pakistani villages, directly helping a million individuals, in the next three years. Recently scheduled projects include electrifying the villages in the northwestern province of Khyber Pakhtunkhwa. "The project with its multifold benefit model, has not only helped in providing a sustainable energy alternative, but has also encouraged female empowerment, increased economic capacity of the rural areas, created literacy about the needs for environmental friendly energy alternatives and the benefits they provide," said Buksh Foundation CEO Fiza Farhan. The initiative seeks to empower females in rural communities by putting them in charge of photovoltaic charging stations, which are used to charge lanterns during the day. The women then either sell or rent the lanterns to villages for PKR 4 (€0.03) a day, providing a much cheaper alternative to high-priced kerosene traditionally used for lighting. Each solar lantern replaces about 500-600 liters of kerosene during its 10-year lifespan, mitigating about 1.5 tonnes of CO2, according to the Buksh Foundation. The organization said that about 43% of the population of Pakistan lives without access to electricity, of which 70% live in rural areas in 50,000 villages, completely detached from the national electricity grid. By 2015, the figure is expected to climb to 46% as the energy deficit worsens; by 2025, it will rise to 64%, with 187 million people having no access to the power grid. A Chinese company is ready to create a special solar fund worth three billion dollars in China to support Pakistan in utilising its solar energy resources. The company has the capacity to establish a solar plant of 1000MW in 6 to 8 months in Pakistan, while 50MW to 100 MW solar energy can be produced in 120 days only. Zubair stated the BOI is mandated to play an important role in the administration and implementation of the government’s foreign direct investment policy. It has a strong record of actively encouraging the flow of FDI into the country through speedy and transparent processing of applications, SEZ Act, and investment policy and strategy. “We welcome investors to make their businesses a success in the most lucrative investment destination of the world – Pakistan,” he said. ‘The energy policy of Pakistan focuses on the alternate energy, including solar energy. The potential of solar is in the range of 7 to 7.5kwh/msq./day in most of Balochistan, 6 to 6.5 kwh/msq./day in most of Sindh, Southern Punjab and Gilgit-Baltistan, and 5.5 to 6 kwh/msq./day in the rest of the country, he added. Our policy to subsidize energy is not working well. We should not subsidize Electricity or Gas but subsidy money should be used for Solar projects and subsidizing Solar energy products. Specially, we should promote solar water heaters, so we can stop burning lot of natural gas to heat water and use that to run our valued industry and transport sector. The chief minister of the Punjab government in Pakistan has just announced plans for the development of a 500 MW solar energy project in the Cholistan region — a project that will apparently be completed with the aid of the Canadian government. The country currently has 22 individual solar PV projects under different stages of development, according to Pakistan's Alternative Energy Development Board. Pakistan is on course to add 772 MW of solar power to its national grid by 2016, according to figures released by the country's Alternative Energy Development Board (AEEDB). There are currently 22 individual solar power projects either under construction or at various stages of development across Pakistan, with a number of these projects awaiting an agreement on a national FIT – details of which the National Electric Power Regulatory Authority (NEPRA) finally announced in late January after months of delays. NEPRA has now published its final FIT incentives for PV projects between 1 MW and 100 MW. In the north of Pakistan the FIT will be set at $0.18 cents per kWh for an initial ten-year period, halving after that time to just $0.09 cents per kWh for the next 15 years. In Pakistan's southern regions, the FIT incentive comes in a little more generously, at $0.19 cents per kWh for the first ten years, but falling to below $0.09 cents per kWh thereafter. In 2013, the AEDB recommended a FIT level of approximately $0.27 cents per kWh nationwide, but NEPRA has calculated a lower rate on the basis of Pakistan's current PV pipeline. AEDB has also revealed that it is pursuing a number of renewable energy projects for the country’s national grid, and has pledged its backing to the solar industry and the wind industry – the latter of which has an estimated 150 MW pipeline in the offing. For solar, AEDB is set to embark on a campaign to promote the installation of residential rooftop PV systems designed for self-consumption. Currently, Pakistan has no building or licensing restrictions on these types of installations. BADAIWANI WALA: For years Pakistanis have sweated and cursed through summer power cuts, but now the government plans to harness the sun's ferocious heat to help tackle the country's chronic energy crisis. In a corner of the Cholistan desert in Punjab province, power transmission lines, water pipes and a pristine new road cross 10,000 acres of parched, sandy land. The provincial government has spent $5 million to put in place the infrastructure as it seeks to transform the desolate area into one of the world's largest solar power parks, capable one day of generating up to 1,000 megawatts of electricity. The desert park in Bahawalpur district is the latest scheme to tackle the rolling blackouts which have inflicted misery on people and strangled economic growth. Temperatures can reach 50 degrees Celsius in the country's centre in June and July, sending demand for electricity soaring and leaving a shortfall of around 4,000 MW. “In phase one, a pilot project producing 100 MW of electricity will hopefully be completed by the end of this year,” Imran Sikandar Baluch, head of the Bahawalpur district administration, told AFP. Engineers and labourers are working in the desert under the scorching sun to complete the boundary wall, with authorities keen to begin generating solar electricity by November. “If you come here after one and a half years, you will see a river of (solar) panels, residential buildings and offices -- it will be a new world,”said site engineer Muhammad Sajid, gesturing to the desert. Besides solar, Pakistan is also trying to tap its unexploited coal reserves -- which lie in another area of the same desert, in Sindh province. In January Prime Minister Nawaz Sharif inaugurated construction on a $1.6 billion coal plant in the town of Thar, in Sindh. Work has also begun on a pilot 660 megawatt coal-fired plant in Gadani, a small town on the Arabian Sea. Another 600 megawatt coal plant has also been given the go-ahead in the southern city of Jamshoro. But while coal may offer a short-term fix to the energy crisis, authorities are keen to move to cleaner electricity in the long run. “We need energy badly and we need clean energy, this is a sustainable solution for years to come,” said Baloch. “Pakistan is a place where you have a lot of solar potential. In Bahawalpur, with very little rain and a lot of sunshine, it makes the project feasible and more economical,” he said. Baloch believes that the new solar park will make Pakistan a leader in that energy in the region. The initial pilot project is a government scheme but private investors are also taking an interest. Raja Waqar of Islamabad-based Safe Solar Power is among them. His company plans to invest $10 million to build a 10 MW project in the new park. “The government has allotted us land over here. Infrastructure, the transmission line and road are available here, that is why we are investing,”Waqar told AFP. A million dollars per MW is a sizeable investment but Waqar said the company expected to reap returns on it over at least the next decade, and others were keen to get on board. Pakistan has tremendous potential for harnessing wind, solar, biomass and other renewable energy resources to help reduce power cuts and improve access to modern energy services. But the country lacks the high quality resource data at a national scale that is needed to take full advantage of these sources of clean energy. For the past year, the World Bank and Pakistan’s Alternative Energy Development Board have been working together to map renewable energy resources across the entire country. The project, supported by the World Bank’s Energy Sector Management Assistance Program (ESMAP), will measure Pakistan’s potential for wind, solar and biomass energy by using ground-based data collection, GIS analysis, and geospatial planning. It is part of a broader Renewable Energy Resource Mapping initiative covering 12 countries. Concluding the first phase of the project, initial maps of solar and wind potential for Pakistan were presented to the government and other stakeholders at an October 15 workshop in Islamabad. The result of months of computer-intensive modeling, these maps represent a significant improvement over previous efforts due to computational advances over the last decade. The maps are based on satellite data and global atmospheric models covering a 10 year period, and can be used to estimate the likely solar or wind potential at any point in the country. However, to get to the level of confidence required by commercial developers, these modeling results must be compared against actual solar and wind measurements taken from ground-based stations. A major part of the ESMAP renewable energy mapping initiative is to collect ground-based measurement data for a period of up to two years. This data is then used to improve the models, leading to the production of solar and wind atlases with a margin of error of as low as 5 percent. These in turn can be used by governments to set tariffs and guide the strategic development of renewable energy, and by commercial developers to carry out feasibility studies, leading to development of solar and wind power plants. JA Solar has delivered PV panels for a 100MW solar project in Punjab, Pakistan. It did not reveal the terms of the deal. The modules will be installed at a 500-acre site at the Quaid-e-Azam Solar Park in Bahawalpur. “The harsh and arid climate in Pakistan is a great challenge for our solar modules,” said JA Solar chief operations officer Yong Liu in an online statement. Quaid-e-Azam — a major project under the China-Pakistan Economic Corridor development programme — is the first utility-scale PV installation in Pakistan. The project — a venture between the Punjab provincial government, Bank of Punjab and Chinese power-transformer specialist Tebian Electric Apparatus (TBEA) — will be scaled up to 1GW by 2016. The 1.25 MW installation in the Punjab province connects to the grid and becomes the largest single utility-scale installation in the country. Chinese solar firm Phono Solar – a subsidiary of the SUMEC Group – has connected Pakistan’s first large-scale PV plant to the grid. The 1.25 MW installation was completed this week in the hot and humid Punjab province under the “Go Global” policy backed by the Chinese central government. Spread across 16,000 square meters, the plant is expected to maximize the high levels of solar insolation in the region to produce an estimated 1,745,000 kWh of solar power annually, and will meet the power demands of 110 local villages. Phono Solar won the bid for the installation nine months ago, and over the course of the installation formed a team with local partner Green Volts Technologies, which brought a cost-effective approach to the operation as well as much-needed local knowledge. The plant will take advantage of Pakistan’s recently introduced Upfront Generation Tariff, which was created to support the country’s fledgling solar PV sector. China’s “Go Global” policy intends to encourage greater investment in the solar sector via working with local engineers and technicians and training them on manufacturing and engineering procedures. "The successful grid connection of the first MW-level PV power plant in Pakistan has brought full recognition of overseas markets for engineering and general contracting capabilities of SUMEC; especially in renewable energy fields," said SUMEC president CaiJibo. "Most of the equipment used in this project is made in China, and I am proud that our equipment has successfully supported the ‘Go Global’ policy and obtained affirmation of new overseas markets." Last month the Pakistan government approved the country’s first net metering program as it attempted to ease the power burden on the power grid, while in December Prime Minister Nawaz Sharif Opens external link in current windowscrapped the 5% customs duty on imported solar panels in an attempt to bolster foreign investment in the country. At present the Electricity Generation Cost is Rs 15 per KWh in Pakistan from fossil fuel based plants. Government Provides Subsidy and Consumer is Charged Rs 8 per KWh. The Solar roof top PV will cost around Rs 7-8 per KWh LCOE. and with storage will cost around 12-15 per KWh. We do not need exotic plants for 80% of households in Pakistan. All we need is proper regulation, unity of purpose, financial incentives and easy loans and the problem of energy shortage will get it resolved within a couple of years. I do not understand why our planners don't see the obvious solution. For reference they can look at Germany, China and Even India and Bangla Desh. The solution is cheap requires practically no maintenance, No power thefts and saves the power for cities and industry and saves the gas for fertilizer. I have complete economics and feasibility studies to share. The solar park in Punjab province produces 100 MW of power, which will be increased to 1,000 MW by next year. The plant, owned by Punjab province and built by China's Tebian Electric Apparatus Stock Co Ltd (TBEA), took a year to build at a cost of $190 million, Pakistani government documents show. "Since I became prime minister my one goal has been to eliminate darkness in Pakistan, and bring lights back to the country," Sharif said in a speech. "By 2017-2018, there will be an end to load shedding," he said, referring to a system of rolling black-outs used to ration electricity. One of the world’s largest solar plants has been opened in Pakistan with the aim of supplying clean, reliable energy and helping alleviate the country’s chronic power shortages. The plant, spread over more than 200 hectares of desert land in the south of Pakistan’s Punjab province, will generate 100 megawatts (MW) in its initial phase and more than 300MW by the end of the year, according to government officials. More than a third of Pakistan’s population do not have access to electricity, and power shortages are a serious impediment to economic growth. Mushahidullah Khan, the Federal Minister for Climate Change, told the Climate News Network that the government is determined to make use of what it sees as the country’s enormous solar energy potential. The plant – called the Quaid-e-Azam Solar Power Park – was constructed in less than a year by China’s Tebian Electric Apparatus Stock Company, at a cost of US$131 million. China has been forging ever closer economic links with Pakistan as part of a plan to link China’s western Xinjiang region to the Pakistan port of Gwadar on the Arabian Sea. The government in Islamabad says China is likely to invest more than $30 billion in solar and other power projects in Pakistan in the coming years. At present, more than 60% of Pakistan’s power is generated from oil and gas, and about 30% from hydro power. Pakistan is considered to be one of the countries in the Asia-Pacific region most vulnerable to the impacts of climate change. In particular, the flow of water in the Indus river – upon which millions depend for hydro power and for irrigating crops – has become increasingly erratic due to changing rainfall patterns, glacial melt in the western Himalayas region, and the impact of widespread deforestation. Government officials say they are determined to push ahead with more solar and wind projects throughout the country. Asjad Imtiaz Ali, chairman of Pakistan’s Alternative Energy Development Board, said the development of solar and other renewable energies was hampered in the past by inconsistencies in government policy, and by a lack of understanding of clean energies. “Solar energy is especially suited to remote areas in the country where connectivity to the national grid is difficult, such as Punjab, Baluchistan and Sindh provinces,” he said. As part of the push for more solar projects, the government recently announced the abolition of duty on the import of solar panels. Pakistan and China are on their way to building the world’s largest solar farm, with the completion of a 100 Megawatt, 400,000-panel pilot power project, the first solar power plant ever built in Pakistan. Spread out over almost 500 acres of flat land in the Punjabi desert and known as the Quaid-e-Azam Solar Power Park (QUASP), the $130 million project took just three months for Chinese company, Xinjian Sunoasis to build. And it is just the first part of a larger project, the $46 billion China-Pakistan Economic Corridor. According to Chinadialogue, when the project is complete in 2017, the same site could see a total of 5.2 million photovoltaic cells producing up to 1,000 Megawatts of electricity – or enough to power about 320,000 homes. Critics say the project will create new environmental problems while it solves others. Built in an area that used to be simply wilderness, and gets 13 hours of sunlight every day, it’s an ideal location for solar power. According to QUASP CEO, Najam Ahmed Shah, it will make energy in Pakistan much cleaner by displacing about 57,500 tonnes of coal burnt each year and reducing carbon emissions by 90,750 tonnes yearly. It will also help Pakistan meets its goal of reducing hydrocarbon usage to 60 percent by 2025, down from the current number of 87 percent. But the project is not without its detractors. Some experts say the project is being built too far from where the energy will be consumed, and require the costly installation of grid infrastructure and subsequent maintenance. And others point out that renewable energy sources still have their own environmental impacts, such as water usage for solar power production. Solar panels need to be kept clean, which requires water to wash them. According to Chinadialogue, the water needed to clean the expected 5.2 million solar panels for the project would be massive – especially for a country like Pakistan that already faces water shortages. And since the project is being built in a wilderness area, the construction and increased human activity will undoubtedly affect biodiversity and fauna and flora in the area. Pakistan has become the first country to benefit from duly validated, high-quality solar maps under a global initiative, allowing it to tap into its renewable energy resources more effectively, the World Bank said in a press release on Tuesday. 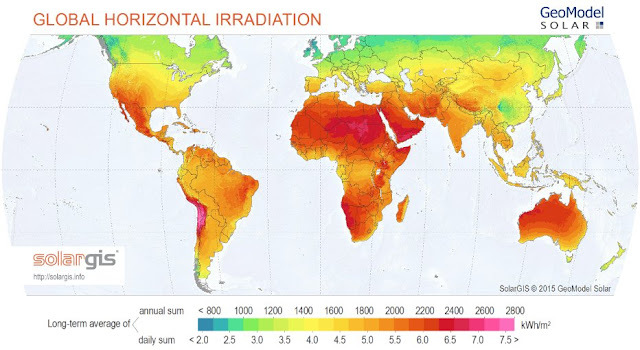 The new solar maps for Pakistan were unveiled today at a workshop hosted by the Alternative Energy Development Board (AEDB) and the World Bank in Islamabad. According to the World Bank, Pakistan is now part of a small group comprising mainly developed countries with access to sustainable and affordable sources of indigenous energy. "With the costs of solar power having decreased significantly over the past couple of years, Pakistan now has the opportunity to unleash investment in solar energy without the need for subsidies," said Anthony Cholst, Acting Country Director for the World Bank, Pakistan. "The World Bank stands ready to support the federal and provincial governments in realising this objective, alongside the support we are already providing for development of hydro-power sector reform and the strengthening of the transmission grid. It is time to realize the full potential of this clean and secure source of energy," he added. "These new solar maps will definitely ensure qualified improvement vis-a-vis previous studies, and will underscore the tremendous solar potential that exists across Pakistan," said Amjad Ali Awan, Chief Executive Officer of AEDB. Awan also appreciated the World Bank for its "valuable contribution" to Pakistan's "continued efforts towards scaling up of renewable energy in an affordable and sustainable manner." Led by the Energy Sector Management Assistance Program, a multi-donor trust fund administered by the World Bank, the initiative will "facilitate investors in making more informed project decisions". "The maps will help large solar power projects in obtaining commercial financing by reducing the resource risk," the press release further said. The World Bank project on solar mapping in Pakistan includes field data being generated by nine solar measurement stations installed two years ago across the country. "The project supports AEDB’s efforts to harness renewable energy in all the provinces by improving access to bankable data," the World Bank statement said. "The solar maps used the latest solar resource modeling techniques, based on 18 years of satellite and global atmospheric data from 1999-2016." The government of Punjab province in Pakistan has reiterated its commitment to install rooftop solar power systems on about 20,000 schools. According to media reports, the chief minister of Punjab province, Shahbaz Sharif, recently reviewed the progress of the Khadam-e-Punjab Ujala Programme. The government-backed scheme aims to set up rooftop solar power systems at schools, health centers, and higher education centers such as Bahawalpur University. The Punjab government has support from Asian Development Bank and the AFD Bank of France for this program. Solar power, and renewable energy as a whole, has found substantial backing from the Pakistani establishment over the last few years. The country continues to grapple with demand-supply mismatch in its power sector with consumers suffering from long hours of load shedding. Pakistan’s dependency on imported electricity has increased as it imports 100 megawatts of electricity from Iran and plans to increase this volume to 3,000 megawatts. Over the last few months several international project developers have announced plans to set up large-scale solar power projects following the successful implementation of the initial phases of the 1,000-megawatt Quaid-e-Azam Solar Power Park, also in the Punjab province. The South Asian country is expected to continue to see such interest from international project developers as the solar power tariffs in the country are at a massive premium to the bids being discovered globally through competitive auctions. Housed in a former commissary building and tucked into the hollers of Harlan County — the heart of Kentucky mining country — is a museum dedicated to all aspects of extracting coal from the state’s mountains. Mining equipment decorates its walls, while a two-ton block of coal at the front door greets visitors. Children can climb on the museum’s 1940s model electric locomotive that once carried Kentucky men into the mines. An exhibit dedicated to Loretta Lynn (who wrote and who is the “Coal Miner’s Daughter”) sits on the third floor. Guests can even wander through an actual underground coal mine. Not much about the Kentucky Coal Mining Museum screams modern. Its website — nay, websites — boasts early 1990s Web design, and its advertisement on YouTube appears to have been shot on a handheld camcorder. It sits next to City Hall on Main Street, the only thoroughfare of Benham, Ky. That’s to be expected from a museum dedicated to an old form of energy, which is what makes its own power methods so interesting. The museum is switching to solar power in hopes of saving money on energy costs, as reported by WYMT and EKB-TV. The installation of solar panels began this week. “We believe that this project will help save at least $8,000 to $10,000 off the energy costs on this building alone, so it’s a very worthy effort and it’s going to save the college money in the long run,” Brandon Robinson, communications director of Southeast Kentucky Community and Technical College, which owns the museum, told WYMT. Robinson wasn’t blind to the incongruity of a coal museum being powered by solar energy, asserting that there’s a symbiosis between the two. As Tre’ Sexton, owner of Bluegrass Solar, told EKB-TV, the runoff power collected by the panels will be fed back into Benham’s power grid. The entire town of almost 500 that bills itself as “The Little Town That International Harvester, Coal Miners and Their Families Built!” will be partially run on solar power. It’s difficult not to see a foreshadowing in the switch to solar power. About 85 percent of Harlan County voted for Donald Trump in the 2016 election. The disparity between Hillary Clinton’s and Trump’s campaign promises concerning energy almost assuredly played a factor in that vote. While Clinton, speaking about renewable energy, infamously said, “We’re going to put a lot of coal miners and coal companies out of business,” Trump promised “sweeping deregulation” of the coal industry. Trump’s plan struck a chord with some miners. Gray hoped Trump’s plan might help. After all, coal mining was once a major American industry. In 1923, nearly 1 million of America’s 110 million citizens worked as coal miners. Now, the industry employs approximately 77,000 people, fewer employees than the Arby’s restaurant chain. Small-scale solar in Pakistan attracted $540 million in 2017, having received less than $100 million in each of the previous two years, according to a report published last month by the United Nations and and Bloomberg New Energy Finance. Solar and wind energy contributed 3 percent to Pakistan’s electricity generation, or about 300 megawatts as of March, according to Arif Habib Ltd.
“Pakistan is one of the biggest frontier markets that has not been tapped,” Jeremy Higgs, co-founder at EcoEnergy, said during a trip to southern Pakistan. In a small tea shop along a dusty, unpaved road in the marketplace of Sujawal, a town about 93 miles east of Karachi in Pakistan, Imam Dino has hit upon a profitable idea. He attracts customers with a 24-inch television playing Bollywood movies through the day and by providing mobile phone charging sockets in a town that otherwise suffers long outages. Power for the TV and charging points comes from a solar-panel system that he rents for 2,500 rupees ($22) a month. It’s been a sound investment. Dino makes as much as 3,000 rupees extra a month because of the attractions. Previously, he spent more to run a gasoline generator. Rural Pakistanis like Dino are increasingly turning to renewable energy to circumvent the country’s notoriously unreliable power supply. Deficient generation and distribution shave an estimated 2 percentage points off Pakistan’s economic growth annually and faults in the national grid are exposed every summer as demand increases. That’s despite a rise in generation by 35 percent to 31,000 megawatts since 2013. As customers like Dino are discovering, off-grid solar may be the answer. With global panel prices plummeting in the past five years, units powering fans and lights are being sold or rented in the nation’s poorest regions for 1,000 rupees to 3,000 rupees a month, according to distributors EcoEnergy and Nizam Energy. About 10,000 solar systems have been installed since 2013 ranging in size from 50 watts to 200 watts, enough to power six light bulbs and two fans. One of EcoEnergy’s customers, Mohammad Ishaque, who farms sunflower and rice fields, pays 1,000 rupees a month for a 50-watt solar system. He previously used oil lamps and battery-powered torches. Meanwhile, at Nizam Energy’s office in Karachi, Chief Executive Officer Usman Ahmed boasts they aren’t crippled by the city’s shortages. Their headquarters is powered partially by solar panels on the roof, which he says is 30 percent cheaper than electricity from the grid. The off-grid market may double annually over the next three years, he said. Back in Sujawal, Dino is happy with his returns. “We are making more money, so it’s been great,” he said, as he mixed tea over burning coals for a packed room. Across the road, a competing tea shop with no electricity was empty.